Urban Decay's Through the Looking Glass Palette is a limited edition colorful palette built on the theme of Alice and Wonderland. Below is a picture of the palette's configuration, which I honestly found unnecessary, over the top, and clunky (but if you are an Alice in Wonderland fan, you might find this quite breathtaking). Somewhere within the complicated packaging, lies 20 awkwardly arranged shades. The shadow arrangement is off-putting and unattractive. You can make a decent eye look with the palette, but then you're faced with the next issue - lack of pigmentation. 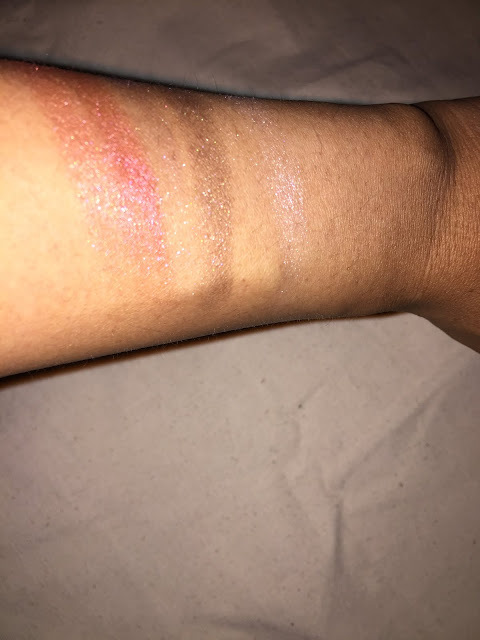 Below is featured four swatches of four random shadows from the palette. The shadows obviously lack pigmentation and color pay off and when you apply them the blend out into the void of nothingness. So, not only do you get strangely arranged, awkward shadows, you get 20 colorless, unpigmented squares in bulky packaging.